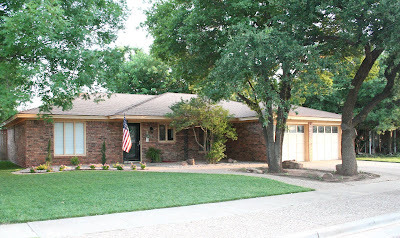 Our front yard (like the rest of the house) was a mess when we moved in: pretty much no grass, huge overgrown trees, a gold storm door, and in need of lots of tlc. We also had sprinklers installed. We planted Pennington (low water, sun-shade) fescue grass seed, and in a few weeks we had a lawn. 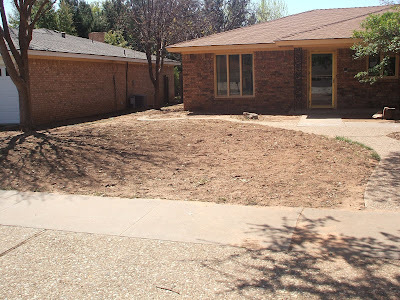 We have also used some sod in the backyard that hasn't done as well. I would choose seed over sod any day~it's much less expensive as well. This is a year later after~he uses Scott fertiler 4-5 times a year and we water deeply 2 times a week. It's pretty much maintenance free~when we had the sprinklers installed, we had a drip put in this area. I was worried with my black thumb that my vincas wouldn't make it, but they held up beautifully in the Texas heat/wind/storms. Tip of the day: This is a great time of year to take a look at what plants and flowers worked well through the summer in yards around your town. If it's still thriving in August/September, take note of it for when you plan your landscapes and gardens next spring. Do a drive by and take pictures (if you're brave!) or if they are outside, ask them about what they've done. 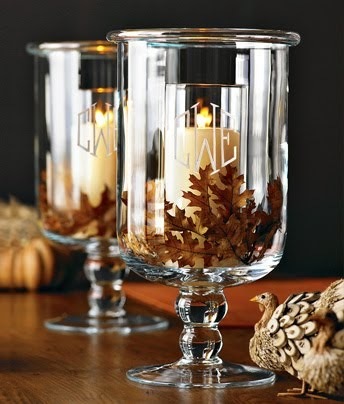 I'm excited for next week; we're going to talk about gifts we can make or makeover, start thinking about, or be on the lookout for now amidst our thrifting so things aren't so crazy come November and December. Each day I'll put a mr. linky up so you can link up if you've got some great ideas for the fabulous frugal gifts we're talking about that day. Until then~have a great weekend! What a difference! Looks great! Beautiful Melissa!! I love it, it looks so Awesome! The McLinky party sounds fun, can't wait! Your yard is beautiful. Your (husband's)hard work is paying off. I can't believe that beautiful grass is in Texas. Great job. Your yard looks great!! What would be your suggestion for painting a kitchen that has been wallpapered and the bottom layer of wallpaper is sticking to the sheetrock> uggg!!! Thanks! 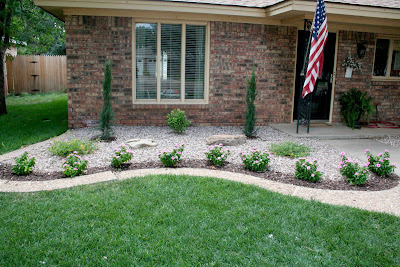 Your yard looks fabulous...what a great makeover! Wow, it looks great... what a before and after!! I really like the look of the line of mulch beside the rock! Your yard looks lovely. We just started tackling ours, I actually posted our first steps on my blog. I can't wait to read your new series, I will be taking notes! 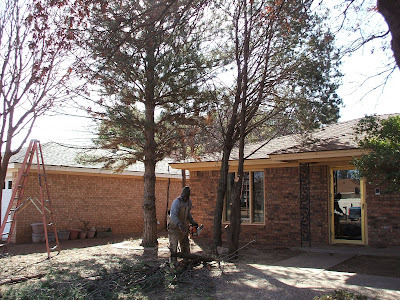 Removing the old pines really made a difference. Good job. It looks very nice! Have you considered using organic products instead of the Scotts chemical fertilizers? I don't like to use the chemicals since I have 3 kids running around. Your lawn looks great and I can't wait for next week. I LOVE frugal gift giving!! Wow! The change is amazing. You yard looks great...we could use some help with our back yard here! Ha! Vincas are the best! They will last all through the heat until if freezes. The yard looks great! 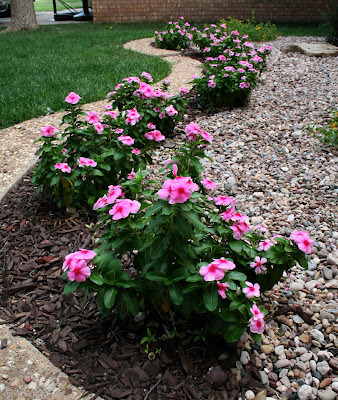 Vincas are wonderful for non green thumbers! That is the only flower I can keep alive and they grow huge if you use a little miracle grow. Also if you can resist pulling them out and just cut them back they will come back bigger and fuller after the winter. We planted them at our last home and I brought my hanging baskets with them to the new house. I love Vinca!! You did an amazing job for that amount of $. Yard work is so expensive and LOTS of work. I know you are tired! Looks great! Vincas LOVE the heat and they come in so many pretty colors. I have a new party starting- Wed Sept 2. It looks GREAT!! My husband would love yours -- he treasures our green lush lawn. Another beautiful transformation here. You make it look so easy. We're in the middle of a project at our house, it isn't going so well. So, I like to come here and dream. 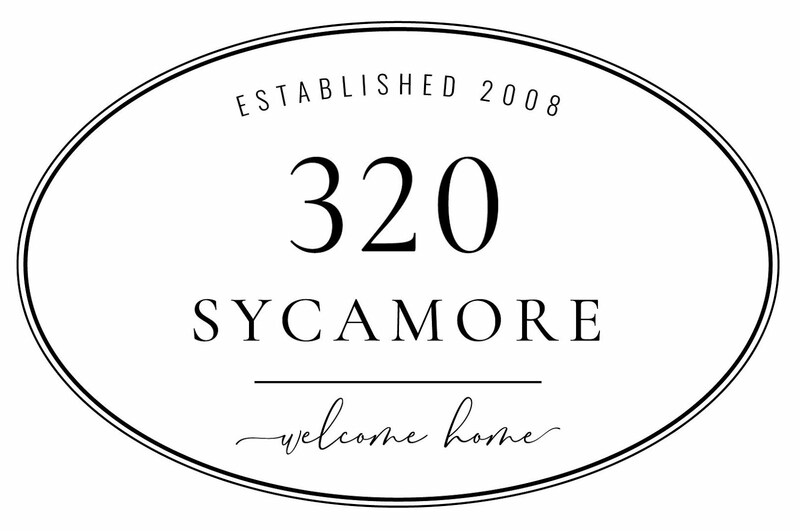 Your yard looks fantastic! I live in SCon the coast, so I know about those hot summers you are referring to. We have not had a lot of luck growing grass. We don't water enough and our dirt is almost straight sand. I'm gonna try that seed you recommended. Thanks for the tip! Can you come over and see if you have any suggestions. I am having problems with my follower section and I need advice. Thanks for a great post. I am very new to this and need your advice about using the Colorcharts from your painting post. It will not work for me. Any tips. P.S. [email protected] for the colorcharts info. Thanks much! * KUDOS and CONGRATS!!!! It looks FAAAABULOUS!!! W*H*A*T a DIFFERENCE!! !~ You should be sooo proud!!! Hey Melissa! Here is the post abt my vincas that I promised! They are a very hearty flower!! Hope your week is going well! The "after" looks so neat and tidy. Nice curb appeal!